Akashi-Kaikyo Bridge - Bridge World - Enjoy the top of the Bridge, the LONGEST BRIDGE in the world! Akashi-Kaikyo Bridge is the longest span bridge in the world, located in Akashi Strait between Kobe and Awaji Island in Hyogo Pref. The total and central span lengths are 3,911m and 1991m respectively. The Bridge was constructed as one of Honshu-Shikoku Bridge project, which is one of the greatest projects in Japan to connect Honshu with Shikoku by both highway and railway. The construction work was started in May, 1988 and completed in April, 1998 after 10 years’ construction period. Akashi Strait (“Kaikyo” means “strait” in English.) is located between Osaka Bay and Seto Inland Sea. The width of the strait is about 4km and its maximum depth is about 110m. The utmost tidal current is about 4.5m/sec (about 9 knots). The surrounding around Akashi Strait is a well-known fishery area and the Strait is designated as an international channel by the Maritime Traffic Safety Act in Japan. About 1400 ships daily pass the navigation. The strait is one of important points at sea. 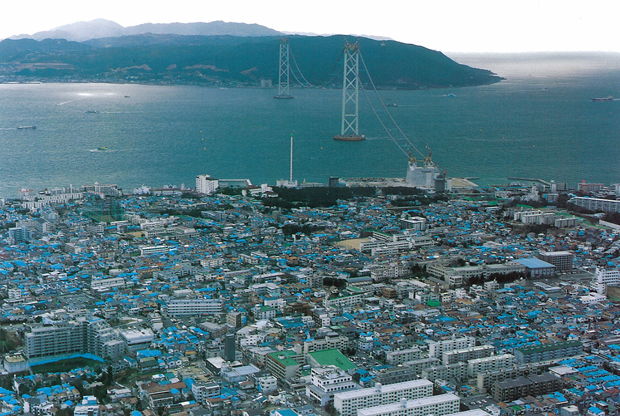 Akashi-Kaikyo Bridge was constructed under such severe natural and social conditions. The Bridge was designed to resist both strong wind, 80m/sec, and great earthquakes such as an inter-plate type earthquake which predicts to occur around Pacific Ocean and an earthquake directly above its epicenter like the Southern Hyogo Prefecture Earthquake in 1995. 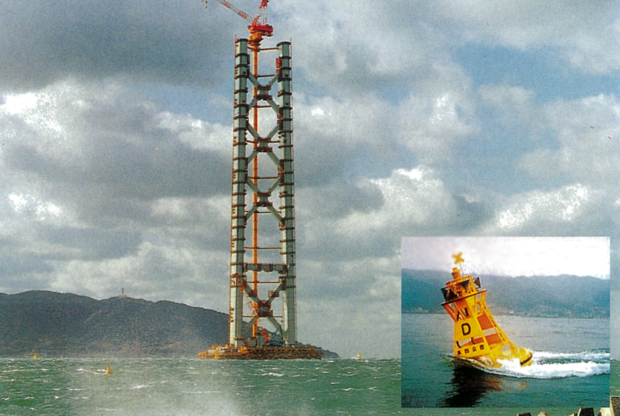 In addition, huge foundations had to be constructed in the deep sea of 60m and under the fast tidal current of 4.5m/sec. The structure also has to support the vertical force of 120,000t. Although the central span length of the Bridge is about twice as long as those of previous suspension bridges, the girder of 1,991m long had to be erected. 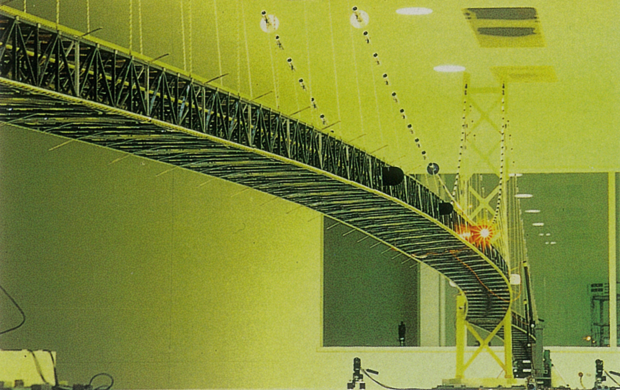 Even under such circumstances, the Bridge was constructed by adopting Japanese own techniques and newly developed technologies. 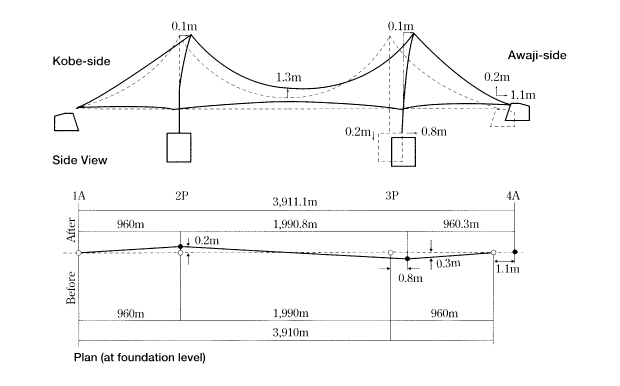 Based on "Seismic Design Standard for Akashi-Kaikyo Bridge (draft)"
The great earthquake of Magnitude 7.2 in Richter scale occurred around Akashi Strait, whose epicenter was 10km to 20km deep, at 5:46 on January 17, 1995. There were a lot of damages during the Earthquake around Kobe and Awaji Island. At that time, Akashi-Kaikyo Bridge was under construction, in other words, both the towers were completed and main cables of the Bridge were being built. After the Earthquake, comprehensive investigation was done. As a result of the survey, it was observed that the span lengths were changed by the Earthquake. However, it was confirmed that the foundations of the Bridge were moved with the bearing ground without sliding between the foundations and the ground. After several analyses considering such conditions, it was clear that the influence of the moving was minimal and the construction work was able to continue as it is. The girder length had to be revised because the length between the towers was changed. This was solved by changing the girder length which was not fabricated. Although the severest earthquake hit the Bridge, Akashi-Kaikyo Bridge was completed after 10-year construction period. Inspection, maintenance and operation have to be given to keep the Bridge in good conditions for more than 200 years from now. In order to do appropriate management, new technology for the maintenance has been researched and developed. One of them is “Dry air injection system”. “Dry air injection system” is to protect main cables from corrosion. The system is to inject dry air into main cables and to keep the humidity inside the cables constant. This system is revolutionary idea because the maintenance cost can be saved. When you join the tour, you can not only walk in the inside of Akashi-Kaikyo Bridge but enjoy the magnificent view from the top of the Bridge tower, 300m above the sea. “Bridge World” offers you such an amazing trip. You should not miss your only chance to join the tour. Please enjoy the scale of the longest bridge in the world! Join the real AKASHI-KAIKYO BRIDGE! Honshu-Shikoku Bridge Expressway Company Limited.